You are currently browsing the tag archive for the ‘Hamilton Luske’ tag. 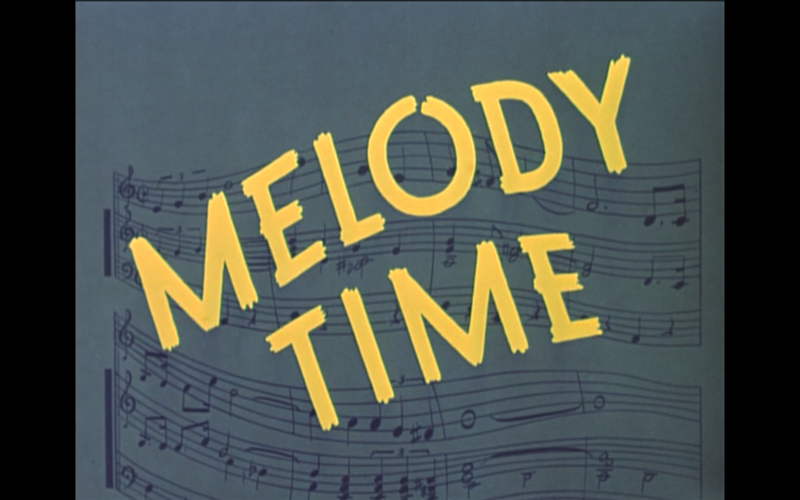 Melody Time’ is a compilation film in the same vein as ‘Make Mine Music’ (1946). It consists of seven unrelated episodes, connected by a voice over and an animated brush. The songs of these sequences are sung by popular artists, who, except for the Andrews Sisters and Roy Rogers, are all but forgotten today. Even more obviously than in ‘Make Mine Music’, these songs are clearly designed for the cartoons, instead of the other way round, like in ‘Fantasia’ (1940). In any sense ‘Melody Time’ is a far cry from that latter film, and the most interesting feature of this film is not the animation, but the film’s beautifully stylized backgrounds, especially in ‘Once upon a Wintertime‘ and ‘The Legend of Johnny Appleseed‘. The sequences themselves are mediocre, often slow and only moderately funny at best. 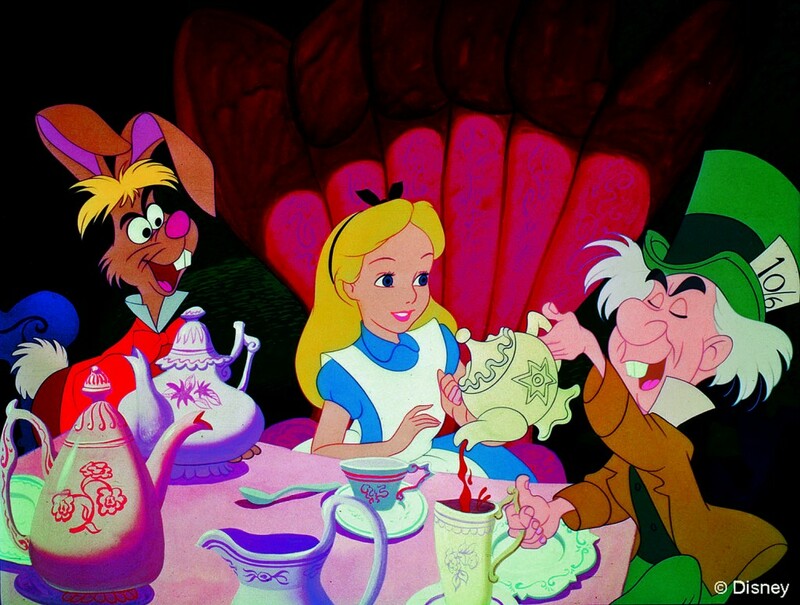 Luckily, Disney would soon return to real features, for ‘Melody Time’ shows that the studio’s compilation features had outstayed their welcome. Fun and Fancy Free’ was the fourth of six package features Disney released in the 1940s. It consists of two unrelated stories, which were both originally conceived as feature films in 1940/1941. The two stories, ‘Bongo’ and ‘Mickey and the Beanstalk’ are loosely linked by Jiminy Cricket, who sings the happy-go-lucky theme song. He plays a record to a sad doll and a gloomy bear which features Dinah Shore telling the story of Bongo in rhyme and song. This cute, if unassuming and forgettable little film (after a story by Sinclair Lewis) tells about Bongo the circus bear, who breaks free from the circus, falls in love with a cute female bear called Lulubelle, and combats a large brutal bear called Lumpjack. Immediately after this story has ended, we follow Jiminy Cricket to a live action setting: a private party with a little girl (Luana Patton), Edgar Bergen and his two ventriloquist sidekicks, the cynical Charlie and the dumb, but gentle Mortimer. Bergen tells a version of ‘Jack and the Beanstalk’, starring ‘famished farmers’ Mickey, Donald and Goofy in their last classic trio outing. This part had a long genesis, the early drafts of this film go back to 1940. Apparently Pinto Colvig had returned to the Disney studio, because Goofy has his voice back after having been silenced for eight years. 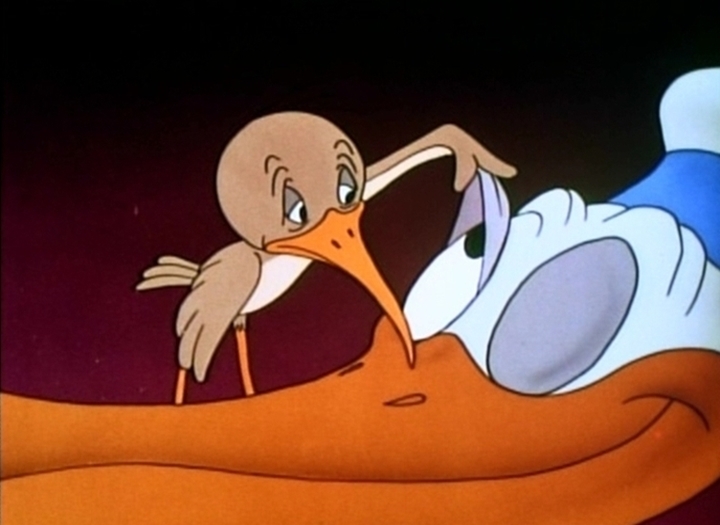 Pinto Colvig would do Goofy’s voice in two subsequent shorts, ‘Foul Hunting‘ (1947) and ‘The Big Wash‘ (1948), before leaving again, leaving Goofy voiceless, once more. 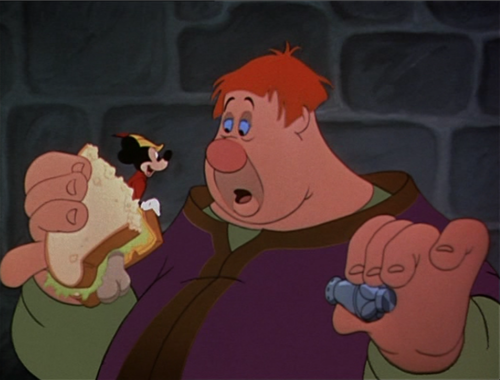 This sequence is also the last theatrical film in which Walt Disney does Mickey’s voice. Halfway the production Jimmy MacDonald took over. This second episode of ‘Fun and Fancy Free’ is a delight, if a little bit slow. Its humor derives mostly from Charlie’s sarcastic interruptions. Nevertheless, the animation of the growing beanstalk and of Willie the giant is stunning. Willie would be the last giant Mickey defeated, after having done with giants in ‘Giantland‘ (1933) and ‘Brave Little Tailor’ (1938). Unlike the other giants, Willie is an instantly likeable character, and he was revived as the ghost of Christmas Present in ‘Mickey’s Christmas Carol‘ (1983). ‘Fun and Fancy Free’ is a lighthearted film. Like Disney’s other package features, it is not too bad, but it is certainly not among the ranks of masterpieces. ‘Cinderella’ was Disney’s first fairy tale movie since ‘Snow White and the Seven Dwarfs’ (1937) and Disney’s first real feature animation film in eight years. First: Gone are the lush water color backgrounds. They’re replaced by way more stylized oil backgrounds, based on the colors and styling of designers Mary Blair and John Hench, who both favored bright and unrealistically vivid colors. Mary Blair’s influence is particularly strong in the dreamlike ‘So This Is Love’ sequence and the chase of Cinderella’s pumpkin couch: here the stunningly beautiful backgrounds lose all sense of realism, in favor of emotional storytelling. Second: The animation of humans, hardly mastered in 1937, now looks fluent, convincing and even easy. It’s also striking how very realistic humans (Cinderella, the prince, the evil stepmother) blend easily and convincingly with more caricatured humans (the king, the grand duke and the two stepsisters) and anthropomorphic animals. The Disney studio clearly had matured. Indeed, the animation studio had been greatly streamlined in the forties. Gone were the experimental, time consuming and costly work methods of ‘Snow White’, ‘Pinocchio‘ and ‘Fantasia’. For his new feature Disney would take no chances: all human scenes would be filmed first with live action actors, in order to perfect the staging before it went into animation. Only one short scene with outrageously colored soap bubbles evokes some of the earlier experimentalism. Disney’s animation unit was now led by a group of younger, highly talented animators, who had matured their skills in the forties, and whom Walt Disney affectionately called his ‘Nine Old Men’. In Cinderella these Nine Old Men are all credited as supervising animators (alongside, like a ghost from the past, pioneer animator Norm Ferguson [see ‘Frolicking Fish‘ and ‘Playful Pluto‘], although his contribution remains unclear). The Nine Old Men would be responsible for Disney Feature animation way up to ‘The Rescuers‘ (1978). 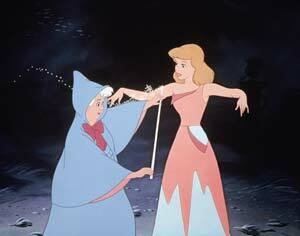 The fluent and confident animation in ‘Cinderella’ clearly shows why. Especially the stepmother (animated by Frank Thomas) is a wonderful character: she’s very nasty, but her evilness is acted out in the subtlest way. She’s only indirectly responsible for the most dramatic scene of the film, in which the two stepsisters tear Cinderella’s dress from her body. The horror of this scene is heartfelt, especially because we had seen that this dress was made for her by some friendly birds and mice in an earlier scene . These animals star a huge subplot with leading roles for a keen mouse called Jaq, a fat, dumb mouse called Gus, and a mean old cat called Lucifer (all animated by Ward Kimball, who went berserk on the outrageous animation of Lucifer). This subplot provides a funny counterpoint to the familiar fairytale and even completely dominates the first twenty minutes of the film. Cinderella was a huge success and paid the studio well. 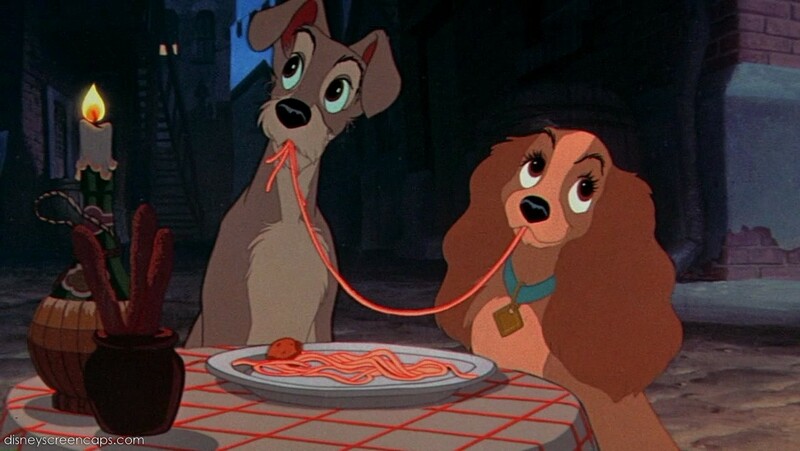 Once again Disney’s attention and reputation rested with animated features and the studio would dominate the scene up to the 1980s, being practically the monopolist on animated features in the United States. In a time when TV would cause the decline and fall of the animated cartoon industry, this was no luxury, at all.